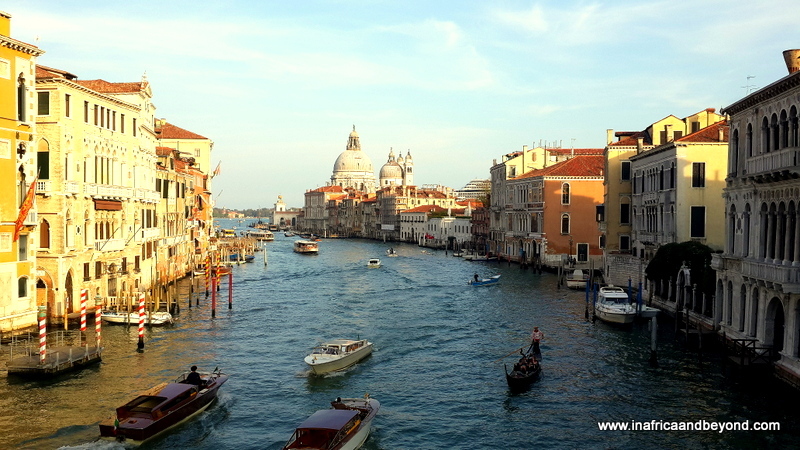 It is difficult to choose just 10 things to do in Venice. From my last whirlwind visit to Venice about 18 years ago, I just remember being serenaded with “Sole Mio” on a gondola ride through the canals and posing for old-fashioned non-digital photos in St Mark’s Square. This time, I spent 3 nights there – 1 night before our cruise and 2 nights after – and although it still wasn’t enough, I tried to do as much as possible in that time. I did my research beforehand and spoke to friends who had been there recently then I planned our activities there carefully based on how much time we had. When researching top activities in Venice on Tripadvisor, I was surprised to see that this was one of the most recommended activities there. So I decided to experience it. It was the first time that I went on a free walking tour anywhere in the world. And although they’re not entirely free as a tip is expected, it was so worth it. Alina was our tour guide and did a great job. The tour was over 3 hours and packed with historic information, entertaining anecdotes and lots of insider tips. 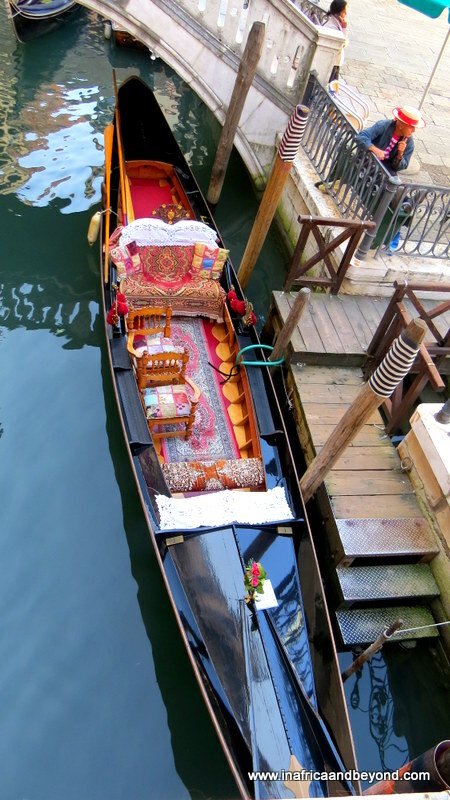 Gondolas are synonymous with Venice but at 80 Euros a ride, they’re not cheap. Our guide, Alina, showed us a place where we could also experience a (very) short gondola ride for 2 Euros each instead. But if you have the time and the money, I would still recommend the longer version to soak in Venice’s ambience. 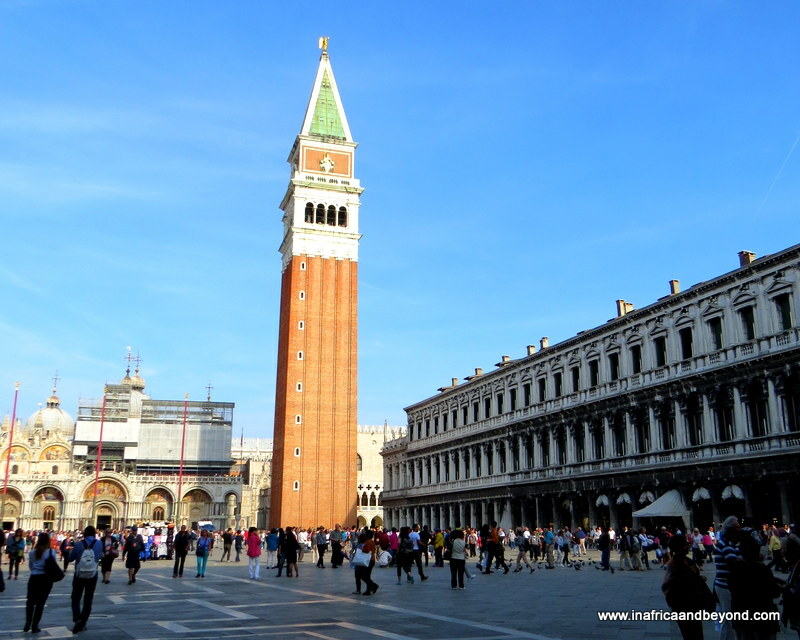 Here you can see St Mark’s Basilica, the Clock Tower, and the Campanile (bell tower), the tallest building in Venice. Or you can sit at one of the alfresco restaurants or on the steps and watch the people and the pigeons. 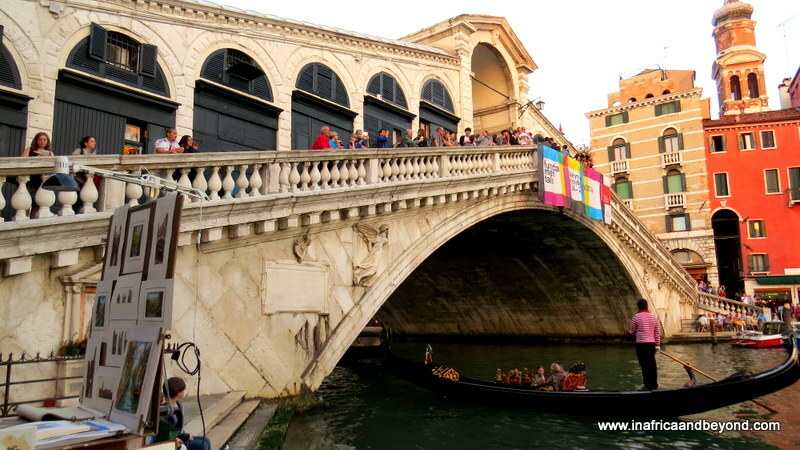 The famous Rialto Bridge is a hub of activity with shops, restaurants and tourists crowding it. It is easy to stand here for hours taking in the sights and sounds of Venice. This is proclaimed as one of the most charming little bookshops in the world. 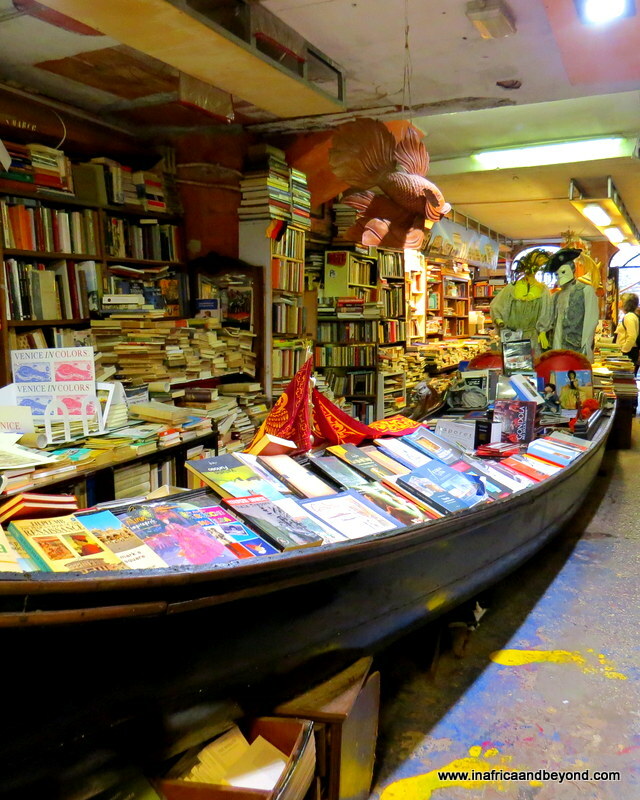 Books are stored in gondolas and bathtubs so that they can stay dry when the Acqua Alta (high tide) arrives. There is even a staircase made out of old books from where once can get great views of the canals. The Doges (leaders) of Venice once stayed here. Here you can admire the ornate works of art. You will also get to cross the infamous Bridge of Sighs and see the prison cell from where Casanova escaped. I found Residenza Ca’ Malipiero on Booking.com . Although it was a bit of a walk from the vaporetto (water bus) stop, once we did find it, it was fascinating. The hotel is set in a beautiful 15th century palace owned by one of the Venetian doges and overlooks a campo (public square) and canals where serenading gondoliers constantly pass by. Here are more places to stay in Venice. 8. Explore the Grand Canal on a vaporetto. You will pass beautiful palazzi (palaces), bridges and museums and take endless photos. 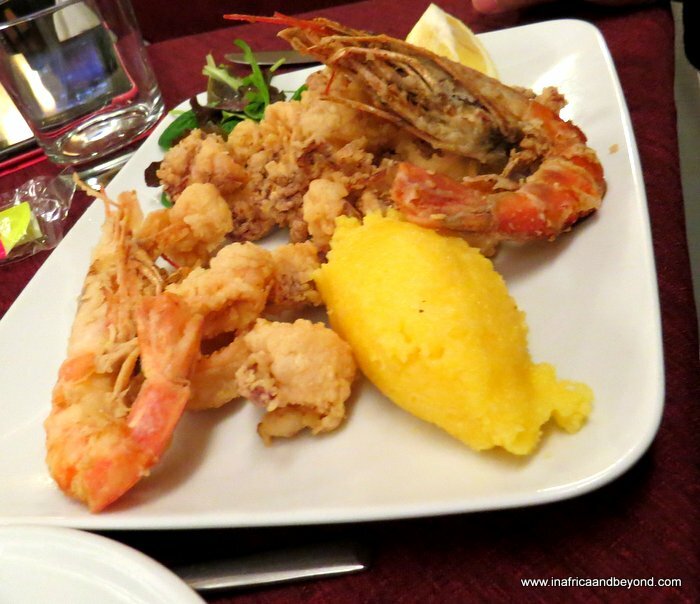 This includes fresh seafood from the lagoon and deliciously refreshing gelato. My kids loved the gelato especially when the pretty young lady behind the gelato counter told my son , “Ciao Bello” ! 10. Explore the nearby islands. Murano is famous for its stunning glass products and you can observe the ancient art of glass-blowing still being practised. 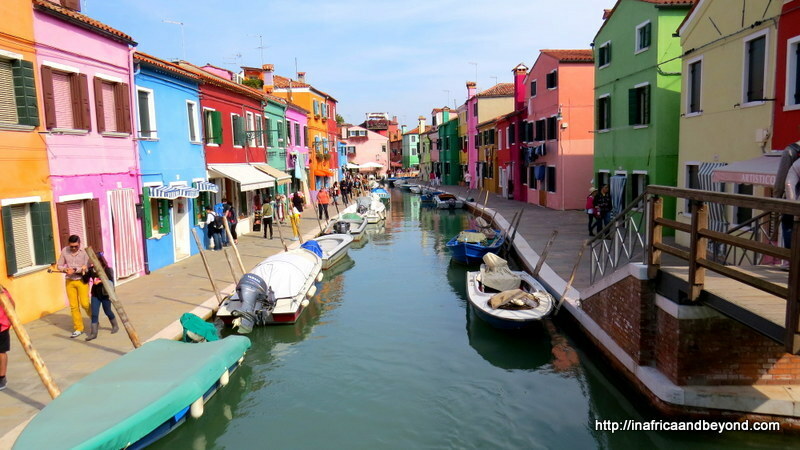 Burano is known as the prettiest little island in Venice. Indeed, when I got there, I felt as though I had walked into a fairy-tale land. Brightly painted houses line the canals as white swans glide by. All this exploring also involves a lot of walking, on cobblestones, steps and bridges so if you are mobility-impaired, you may find it a bit difficult to navigate. 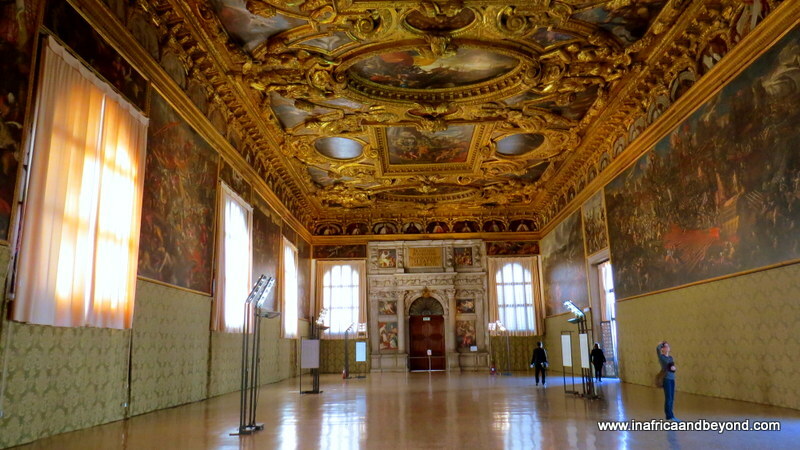 There is a lot more to do in Venice but these are my top picks. What are your favourite things to do in Venice ? Fall in love with Venice here. 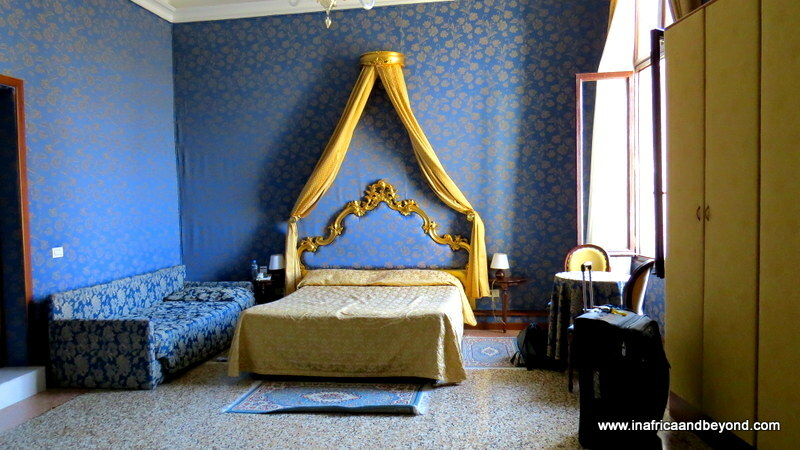 Find accommodation in Venice here or here. Glad that you included Libreria Acqua Alta, I loved that bookshop! I still can’t believe I haven’t made it to Venice yet! There’s lots of things on this list I haven’t heard of before so I’d like to try some of them out – that Palace looks fabulous! I’m glad it helped Stephania. One day is one day ..!! WOW! I am ready to go visit Venice! thanx for the tips. Thank you Sharifa. Hope you get to go soon! Thank you Ummbilal01. I hope that you will visit soon! Ahh, I’m itching to travel again since I moved back home and settled down! Venice looks amazing, that gondola is so beautiful and I would love just wandering around that city. Thanks for the tips! Thank you Foz -hopefully it will be soon! thanks to your post i have a glimpse of venice. truely amazing. 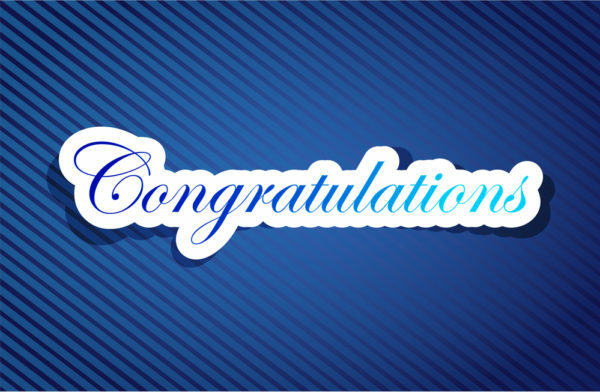 Thank you Haya – Never say never – you may end up going sooner than you think! Thank you Sahar and Amina! I’ve never been to Venice but my imagination is in full drive now – *thanks to your images and descriptions*. Hope to visit soon in sha Allah. I hope you get to go soon Ayesha. It really is a beautiful place. I hope that you get the opportunity soon @BritDeshiMummy. You also have the advantage that it is nearer to you in UK than it is to me in South Africa!